Our journey to Flagstaff was shaping up to be a rough one, no desert, no Route 66, we were feeling pretty low. But we were still on track to arrive far earlier than planned, and needed something to fill the time. We decided to check out the Petrified Forest national park is north east Arizona, as it was right on our route. It turned out to be the best decision we’ve made so far. 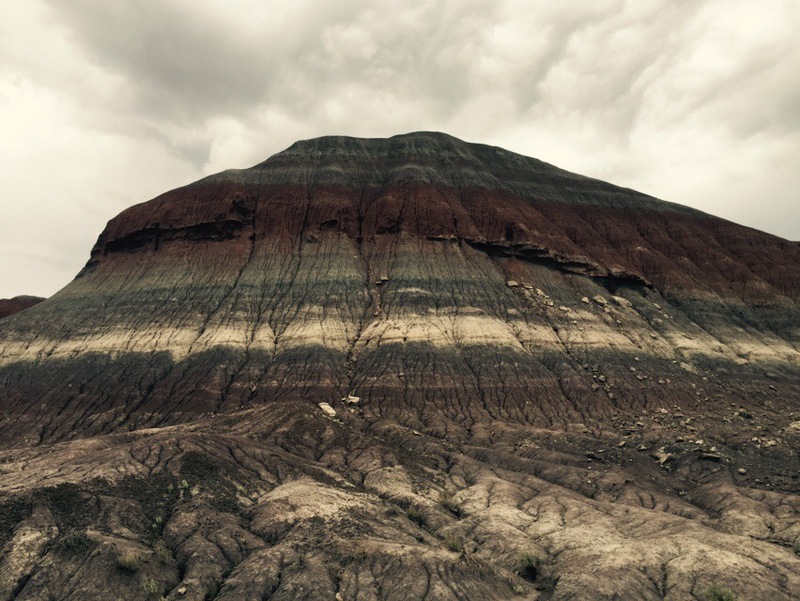 The petrified forest is located in the painted desert, one of the most spectacular landscapes I’ve ever seen. The trees, from the Triassic era, have been fossilized; and some have even turned to various minerals, creating an unimaginable spectacle of light and luster. We entered the park expecting to kill an hour or so, and ended up having to stop at every single outlook, because the views just didn’t stop getting better. Day 7 Road Updates: 12PM Mountain, Again. We’re on the road again and desperately trying to find Route 66, which is proving far more difficult than anticipated. It seems to have simply been paved over by Interstate 40, and all the signs for the route lead to dead ends or Indian reservations. 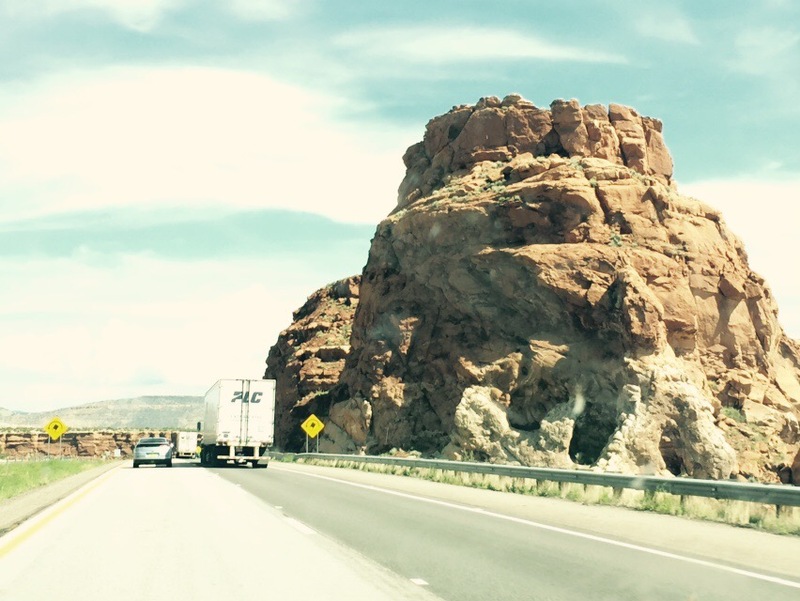 The mountains have transformed into gigantic mesas, huge faces of red rock layered across the horizon. We still aren’t in the desert proper, but hopefully we’ll find some of it by the time we reach Flagstaff. More updates to come. 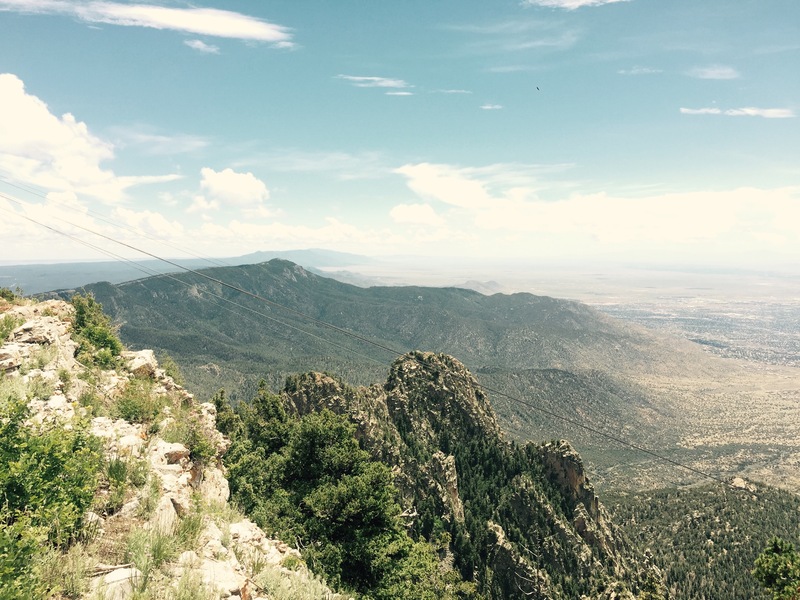 By far the highlight of the day, our journey to the top of Sandia crest was one of the most amazing things I’ve ever experienced. The mountain was first discovered by the Spanish, who gave it it’s rather interesting name. It’s many granite faces are rife with a reddish mineral called feldspar. When the evening light hits the mountain, the feldspar is illuminated, and the entire range glows a brilliant pinkish red. This crescent sliver of pink on the horizon is what gave the mountain its title, as “Sandia” in Spanish, is watermelon. We awoke to the sound of pounding rain, as the storm we saw yesterday finally caught up with us. After noticing two shirtless hillbillies drinking beers essentially outside our door, we decided now was as good a time as any to leave this Alien environment (haaa) and head to Albuquerque. Currently were searching for a McDonald’s so we can cop some pancakes, however our search has been less than fruitful, there’s literally nothing out here. Today we left Dallas and headed straight to Roswell, NM. You can read about our travel terrain on Matt’s earlier post but anyways we made it to Roswell in about 7 hours and were instantly surrounded by alien propaganda. We went to a small gift store and then the UFO Museum which was filled with historical “sightings” and what not. 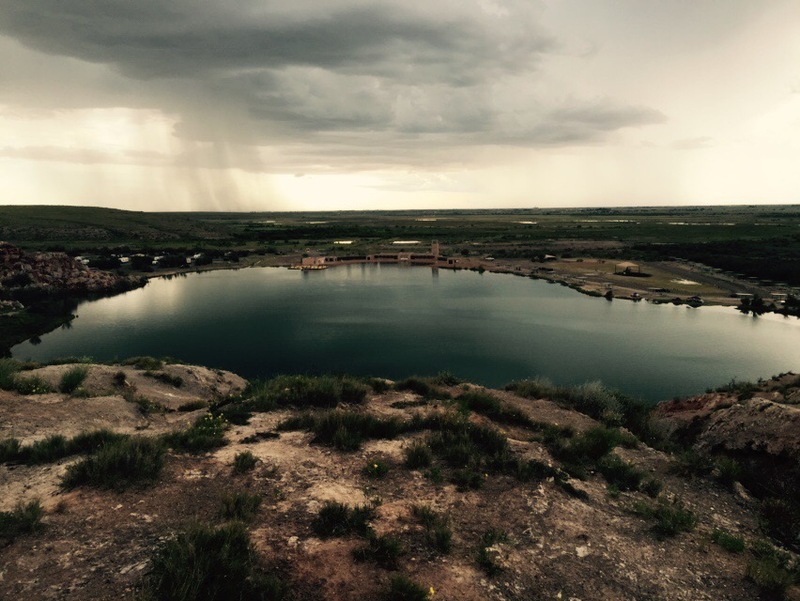 After we left the downtown area, we headed to Bottomless Lakes State Park, which you can read on Matt’s last post. After exhausting downtown Roswell of its potential, we decided to strike out to a nearby state park: Bottomless Lakes. Though not actually bottomless, the park consists of about 8 huge sink holes ranging from seventeen to over a hundred feet deep. The water is very dark, but not so shaded as to betray it’s unnerving depth, a trait many tourists have been caught off guard by. As you can see, rain was not far off; but the weird thing is, the land is so open you can see the entire storm system from just about anywhere. We literally watched the rain slowly creep across the land, giving us plenty of time to explore the area. Although Andrew was put off by our first Tarantula sighting, we didn’t let it stop us and trudged on to the overlook, which proved to be well worth it as the view was truly spectacular (pictured above). In addition to the lakes, the area played host to a variety of red rock facades and twisting road, making it a welcome detour from the intriguing but altogether unsettling town of Roswell. After a great night in The Adolphus we’re back on the road, and honestly, a little sad to see Dallas go. The city was amazing, a REAL city, skyscrapers, new developements, beautiful parks, and tons of history. The heat has yet to realy pick up, but that’s sure to change as we head into western Texas and New Mexico. I would post pictures but as we head through the 700 some odd square miles of city that is Dallas/Fortworth, all there is to see is highway. Tertiary update: They have a GIANT Six Flags smack in the middle of the city. Its weird. Today we left Baton Rouge, LA to head towards Dallas, TX. At the last moment we decided to change hotels so that we could stay downtown Dallas. That decision became as a fantastic one where we found a really nice hotel for a great price called Adolphus Hotel. It is currently under renovations but our room seemed all updated! We then headed a few blocks to check out the location where John F. Kennedy was assassinated and saw the “grassy knoll”. Then we headed up to Reunion Tower to check out the entire Dallas skyline and you can see the photos below!